Banana bread usually has a texture closer to a cake than a bread. While the ideal banana bread is moist, banana bread that is too wet is unappealing. There are several possible causes for wet banana bread. It could be cooked unevenly, have too little flour or too much fruit, or merely be undercooked. 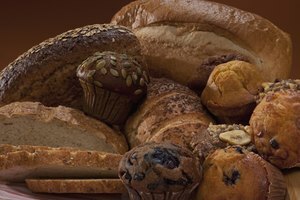 Checking the oven temperature, using the right sized pan, accurately measuring ingredients, and checking the bread for doneness before taking out of the oven can keep your banana bread from being too wet. Check your oven's temperature to make sure it is accurate. Baking banana bread at too hot a temperature can cause the outer portions of the loaf to cook too quickly, producing a banana bread that is over-cooked on the outside and undercooked in the middle. Bake with the correct-sized pan for the recipe. Using a pan that is smaller than the one called for will mean that your loaf is thicker than the recipe intended. This means that the banana bread will need additional cooking time to be baked completely. Measure flour carefully. 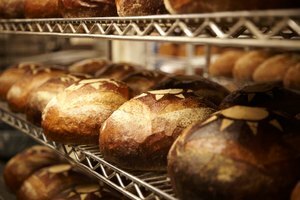 If you use too much flour, the bread will be dry; if you use too little, the bread will be too wet. Flour is compressed in the bag, so it needs to be aerated before using it. Pour the flour into a canister, and whisk or stir it to loosen it. If the recipe requires the flour to be sifted, sift before you measure. Use a measuring cup designed for dry ingredients, and spoon the flour into it. Do not use the measuring cup as a scoop. After you have filled the measuring cup, pass a knife over the top to remove any excess. Bake with only the amount of banana called for in the recipe. If the recipe calls for 1 1/2 cups of mashed banana, using more could make the bread too wet. Since bananas are not uniform in size, you will probably have a piece of a banana left over after measuring the amount of banana called for. While you may be tempted to add it to the batter - don't. Discard it, or freeze it to use the next time you make banana bread. Check to make sure the banana bread is cooked before removing it from the oven. When the prescribed cooking time has been reached, insert a wooden skewer in the center of the loaf. If there is a crack across the middle, insert the skewer in the center of the crack. If the skewer is clean when you remove it, the banana bread is done. If there is batter clinging to the skewer, continue baking the bread for 5 to 10 minutes, then check again. Allow the bread to cool thoroughly before wrapping it for storage. Wrapping the bread while still warm can trap steam which can cause the bread to become soggy. 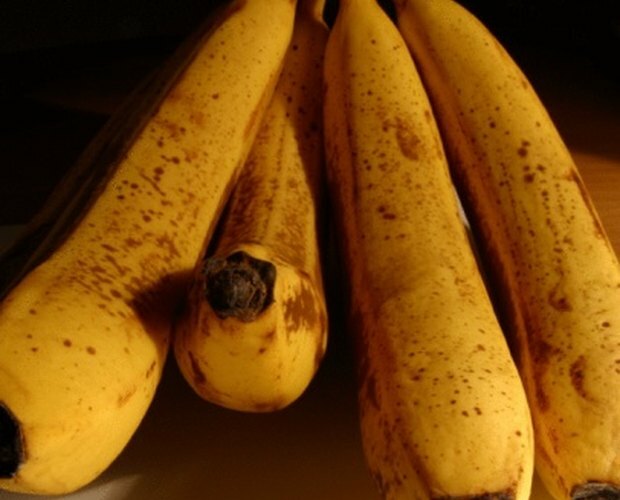 Freeze over-ripe bananas instead of discarding them. Thaw them in the refrigerator the night before you plan on making banana bread. Susan MacDowell is a freelance writer from New England. She is a CPA by training, but has many additional interests, including history, baseball, cooking, and travel. She's a native of New York, who now lives in Massachusetts and Maine. 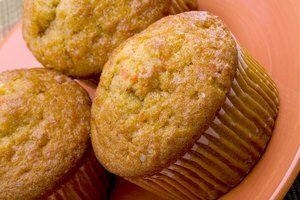 Can You Turn a Muffin Mix Into a Bread Mix? 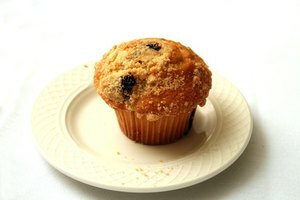 What Causes Dry & Hard Muffins?